I have received several emails concerning where people can purchase Team USA Merchandise. Right now, there isn't much on the market except for T-shirts, hats, and jerseys. If you are looking to purchase hats or t-shirts, I suggest contacting USA Hockey and ordering through their catalog. 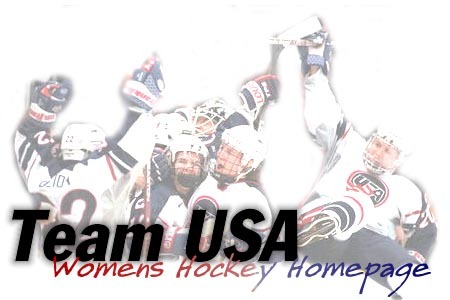 You can view their catalog online at www.usahockey.com. If you are looking to buy a jersey (personalized or not) I would like to suggest Sports Image which is based out of Toronto, Ontario. I purchased a Team USA jersey with "Granato" on the back. I am quite pleased with the quality of the stitching, service and most of all, the price. The jersey (shipping included) cost approximately $140 US and it was at my house within seven days. They grew up in the harshest realities and still they accomplished their goal. This, in just a few words, summarizes the United States Women's Hockey Team. Opposing coaches would send their "big" players after Cammi Granato. Karen Bye had to register under the name K.L. Bye, so her teammates parents wouldn't reject a girl playing hockey. A majority of the team just had to go against their parents dreams of their little princesses being figure skaters. While it took a lifetime for these 25 women to make history, in the eyes of the world, it only took 60 minutes. And what a 60 minutes it was. The gold medal game was a sure match between the USA and Canada as the experts predicted. Yet in only a short period of time, these two teams concocted the most memorable match for world supremacy. Our recipe begins with rivalry. Mix together the United States and Canada. The battles between the Men's teams long ago has carried over to the Women. In what has become the rivalry of the decade, the Americans and Canadians have far surpassed the exciting rivalries of the NHL. Throw in some history. The Canadians have taken control of every tournament in the history of women's hockey. Add them up: Four gold medals in the Women's World Championships, two gold medals in the Pacific Rim Championships, and a silver medal at the Three Nations Tournament. Let's face it. The American's are getting sick and tired of listening to "O Canada." After a 4-3 loss in the 1997 World Championships, USA Coach Ben Smith stood his team outside the Canadian locker room, making them listen to the cheers of their rivals, and victors. As Forward Katie King put it, "Right then, we decided, Enough." Next throw in revenge. In a Round Robin match up against Canada, the United States answered the taunts and four goals the Canadians threw at them with six unanswered goals. With the Canadians posting a 4-1 lead going into the third period, the Yanks took only 13 minutes to turn the game around. The comeback started and ended with goals by Laurie Baker. In between, Cammi Granato and Lisa Brown-Miller netted one each, and Jenny Schmidgall and Tricia Dunn also scored -- within 23 seconds of each other. After this embarrassment, the Canadians were looking to win when it counted most. Finally drop in controversy in the middle of it all. Following the last game of the round robin tournament, a confrontation between a group of Americans and team Canada's Dannielle Goyette ensued. Words were exchanged, with Goyette leaving frustrated, almost smashing her stick against the boards. Later, accusations were made towards the US, with Team Canada head coach Shannon Miller insisting Sandra Whyte taunted Goyette about the recent death of Goyette's father. Everything stews in one big melting pot for three days prior to the game, and finally all the frustrations are taken out onto the ice. With the US leading 2-0 in the third, Goyette scored, keeping the Canadians within reach of the gold. Whyte, with eight seconds left, bangs the final nails into the coffin as she scores an empty netter. With one goal, Whyte has silenced the taunts of Miller and her team, as her own teammates go wild on the bench. In the end, the Americans rejoiced; the Canadians cried. The underdogs had captured not only the gold, but the heart of their nation. Finally, everything they went through to even get onto the ice meant something. As they stood with the medals around their necks, they laughed, they cried, and they even sang the National Anthem off key. As always, tell us what you think. We'd love to hear from you. If you would like to send your thoughts or ideas, send us some E-Mail! © 1998 Cyber Ice Web Design.